The chimney crown is the top element of every masonry chimney. 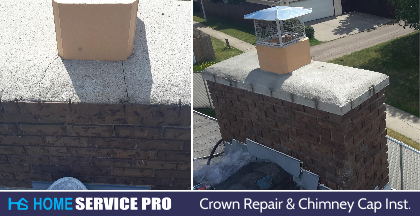 Unfortunately, the crown, which is supposed to protect the inside of your chimney from water can quickly deteriorate and allow water to wreak havoc on the inside of your chimney. 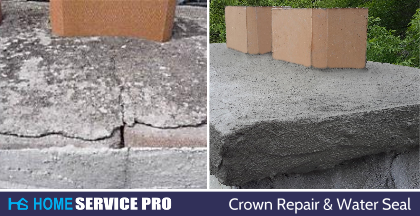 Basic maintenance will help prevent crown erosion, and water damage. Having the crown patched and water sealed every 5 years will prevent the need of a major chimney crown reconstruction, or even a complete chimney re build. A proper chimney crown should be constructed to provide an overhang to protect the sides of the chimney. This overhang should be a least two inches. Chimney liners should be constructed with a heat expansion joint where the concrete crown is. This step is often overlooked by masons, and results in fracturing chimney crowns. The longer this is left untreated, the more damage that will ensue.